FFA - CAIR denounces Columbus Ohio Police Department for continuing to ban officers from wearing hijabs. Please send email to thank police and mayor for their decision. Click here to send your email to thank the Chief of Police, Deputy Chief of Police and Mayor for continuing a values neutral dress code for law enforcement officers by not opening the policy to allow hijabs, scarves and other cultural attire. The Council on American Islamic Relations (CAIR) wants female Muslim law enforcement officers across America to be permitted to wear hijabs when they are on duty to protect all citizens of all faiths. So CAIR jumped on the opportunity to publicly criticize the Columbus Ohio Police Department for deciding to continue the ban on head scarves for their officers. Woods said police did not talk to anyone in the Muslim community or the city's Community Relations Commission before making the decision. That disappoints Romin Iqbal, staff attorney for the Council on American-Islamic Relations' Ohio chapter. "I'm baffled and very disappointed that the city continues to not allow a whole population of Columbus to become cops," Iqbal said. The division's concerns about uniformity of dress, he said, could be easily addressed by modifying the color and style of head scarves worn by Muslim women. The Ohio Constitution gives people a right to religious expression at work, he added. And the city has to prove it has a compelling reason not to allow a woman officer to wear a head scarf and that it is advancing that interest by the "least restrictive" means possible. "Our police department needs to show they are interested in diversity and want to represent the diverse people in Columbus," he said. Woods said police officials consulted with the city attorney’s office, and current case law supports the decision, which he said was ultimately made by Chief Kim Jacobs. Police were also concerned about safety, he said. For example, officers wear clip-on ties so that they can’t be used to gain control. He said gas masks won’t fit over the scarves. 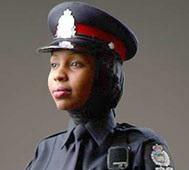 Mvslim.com boasts in this May 16, 2015 report that the St. Paul Minnesota Police Department allowed the first law enforcement officer in the state to wear a hijab. Only a values neutral dress policy can be certain to instill the best sense of security in the greatest number of citizens the police department serves. The badge of a law enforcement officer should be the only symbol that citizens see when an officer arrives to serve and protect. Florida Family Association has prepared an email for you to send to thank the Chief of Police, Deputy Chief of Police and Mayor for continuing a values neutral dress code for law enforcement officers by not opening the policy to allow hijabs, scarves and other cultural attire.